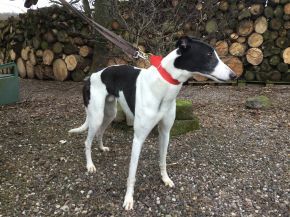 TIM is a gorgeous looking black and white male with a fantastic nature to match. He has the most beautiful face and his coat is beautifully soft. He is very sweet - natured and although he is a little bit shy at the moment, he loves being with people and enjoys snuggling and getting loving attention. He gets on well with other greyhounds and he walks happily with another dog beside him. He will blossom with a quiet family or couple who have time to bring out his fantastic nature with fun, love, walks and new situations.